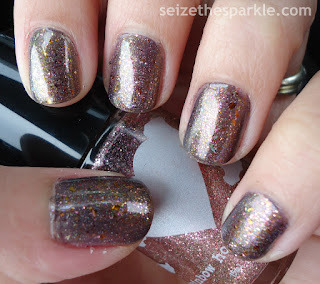 I will be the first person to admit that I've got an addiction to Autumn People by Pahlish. Pretty sure I should've ordered two bottles, because at the rate I'm going, there will be none left! But it's so amazingly gorgeous layered with other polishes, and when Rainbow Honey Baked Raspberry Glaze came? I knew that I'd have to pair them together. For my Thanksgiving manicure, I did just that, pairing the two over Choo Choo Choose You from China Glaze. So I mentioned that this was my Thanksgiving manicure right? It was also what I wore on my nails the day after that, and the day after that, and then... well, you get the point! It's maybe the second or third time I took off a manicure only to repaint my nails exactly the same way again. And then wear it for another couple of days. I think I wore this one for about a week, and I loved wearing it the entire time! You see, Thanksgiving is always a little bit crazy. Things get busy, I get tired because I'm busy, but I don't want to miss out on any real world fun. So, I tend to paint my nails for a little more longevity over the Holidays. Hence the 2 coats of Clear Coat, if you were wondering why I didn't use my usual one. 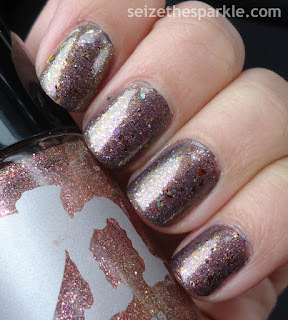 Autumn People by Pahlish is a gorgeous multichrome flaky polish that I'm absolutely enamored with. "Red ultrachrome flakes, gold flakes, multicolored chameleon flakes with neon purple shimmer," according to Pahlish with flashes of blue and green here and there. Baked Raspberry Glaze by Rainbow Honey is a glitter topper with gold and pink fine shimmer with a scattered holographic glitter that just explodes in sunlight. 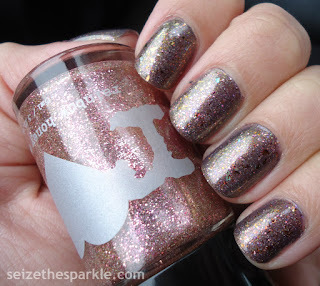 China Glaze Choo Choo Choose You has a sheer duochrome base that shifts from dark bluish-purple to purply-gray. Then there's an extra-fine shimmer that flashes red to gold to green. Put them all together, and at the time, it really reminded me of gingerbread, but Holiday Fruitcake is a much better analogy. 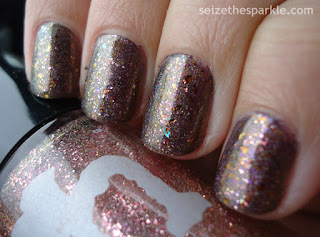 I always think its cool when glitter toppers change the look and effect of polishes like Choo Choo Choose You. There's just a whole lot of color shifting sparkle going on here. And honestly, this layering went with literally every outfit I could throw at it. That's always a plus! So yeah. Sometimes, less is more. But sometimes, you've just got to layer a multichrome flaky over a glittery holographic shimmer that you painted over a duochrome polish with color shifting shimmer. And if anyone asks? Because glitter. Because sparkle. Because you can. And if you've got polishes along these veins, you totally should!